A 74-year-old woman presented to our clinic with severe ischemic claudication and rest pain (Rutherford class 4) that was refractory to conservative medical intervention of walking, dual antiplatelet therapy, and statin therapy. The patient had a family history of coronary artery disease and diabetes, as well as a medical history of smoking, type 2 diabetes mellitus, hypertension, hypercholesterolemia, carotid artery stenting, abnormal ankle-brachial index and duplex ultrasound results, and multiple prior bilateral endovascular peripheral interventions for severe ischemic claudication. A preoperative lower extremity arterial ultrasound indicated mild arterial occlusive disease in the right common femoral artery (CFA), moderate disease in the right superficial femoral artery (SFA), and a totally occluded right posterior tibial artery. Using fluoroscopic guidance and micropuncture, percutaneous access was achieved to the left CFA via a 7F Flexor Raabe sheath with sidearm (Cook Medical) using a contralateral antegrade approach. The sidearm was flushed with heparinized saline, and a selective left CFA angiogram with distal runoff was obtained. 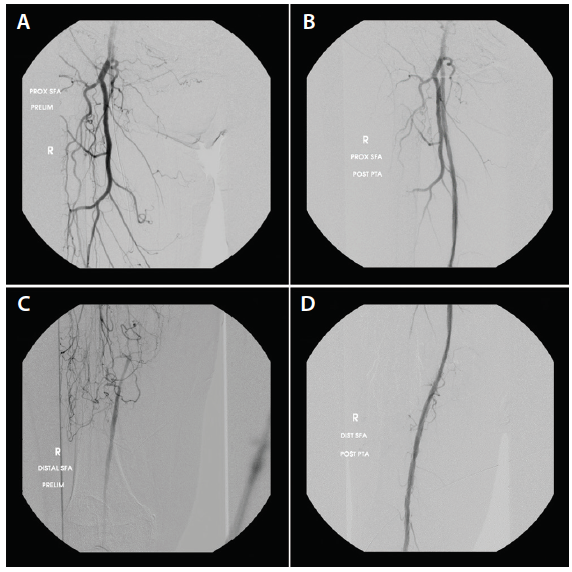 A 0.035-inch stiff, angled Glidewire (Terumo Interventional Systems) and 5F LIMA catheter were advanced to the right CFA, and a selective right CFA angiogram with distal runoff was obtained. A therapeutic dose of heparin was given intravenously. An intravascular ultrasound revealed a totally occluded SFA, a 72% stenosed popliteal artery, and a 78% stenosed peroneal artery. Each lesion was approximately 30 cm in length and moderately calcified. Various treatment modalities were considered. Key considerations for device selection included that we needed a device that could successfully cross the chronic total occlusion (CTO) and treat the length and complexity of the lesions. We opted to use the DABRA Excimer Laser (Ra Medical Systems, Inc.) because of its wireless platform that allows for crossing of CTOs and its demonstrated ability to quickly and safely treat long and complex lesions without any clinical or angiographically observed distal embolization. Debulking of the totally occluded right SFA and the severely occluded popliteal and peroneal arteries was accomplished with the 5F DABRA catheter, creating a smooth channel through which we were able to easily advance a 3 X 300 mm balloon catheter (Ultraverse, BD Interventional) to the peroneal artery, where angioplasty was performed at nominal pressure for 5 minutes. The balloon catheter was withdrawn, and a 6 X 300 mm balloon catheter was advanced to the SFA and popliteal arteries, where it was dilated nominally for 5 minutes. Postprocedural angiography confirmed excellent intraluminal expansion of the treated lesions, with < 10% residual stenosis in the right SFA and popliteal artery and < 10% residual stenosis in the right peroneal artery and tibial peroneal trunk, brisk distal runoff, and increased filling of collaterals perfusing the right posterior tibial artery and anterior tibial artery (Figure 1 and Figure 2). Vessel closure was achieved using the Angio-Seal device (Terumo Interventional Systems). The case concluded with no complications, and the patient was discharged on the same day. The total procedure time was 1 hour and 5 minutes, which was relatively brief considering the number and complexity of lesions treated. Figure 1. Pre- (A) and postprocedural (B) angiograms of the proximal SFA. Pre- (C) and postprocedural (D) angiograms of the distal SFA. Figure 2. 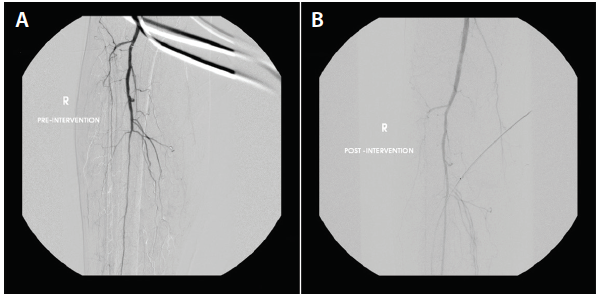 Pre- (A) and postprocedural (B) angiograms of the peroneal artery. This case highlights the utility and versatility of the DABRA catheter in a challenging case that was not well suited for angioplasty or stent placement alone. The device has an innate tendency to stay intraluminal in all vessels, it is versatile as a single device for debulking above the knee and below the knee, easy to use, and cost-effective. Furthermore, we have not observed any clinical or angiographically evident distal embolization. The device allows for effective treatment of challenging CTOs that would be difficult or impossible to treat with traditional devices. Disclosures: Consultant to Ra Medical Systems, Inc.